Congratulations to Dr Martin Barr, from the Thoracic Oncology Research Group at St James’s Hospital & Trinity College Dublin, who was awarded the 2018 European Association for Cancer Research (EACR) Young Scientist Award (Senior Category) at the recent 54th IACR Annual Meeting in Dublin. 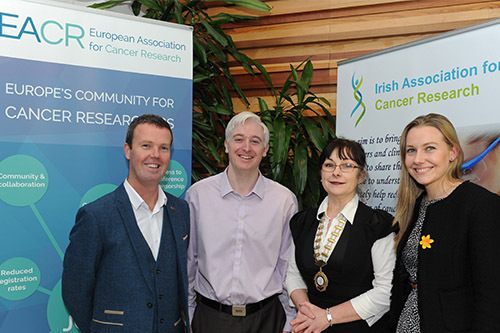 From left to right: Dr Martin Barr, Andrew Binns (EACR), Professor Amanda McCann (IACR President), Naoise Synnott, UCD (Junior Category winner). Our Thoracic Oncology Research Group have also been shortlisted as Finalists in two categories of the 2018 Irish Laboratory Awards; Research Laboratory of the Year and Healthcare Laboratory of the Year.